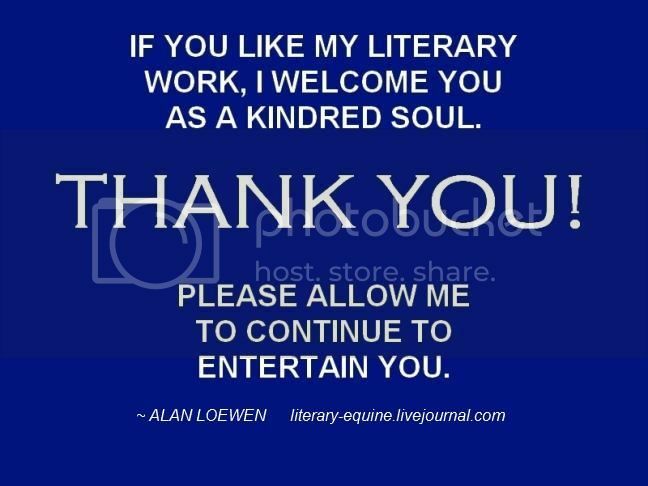 This is the professional and public journal of author Craig Alan Loewen who writes under the names C. Alan Loewen or Alan Loewen or Stephen King. No. Wait. Sorry. Scratch that last name. My purpose in writing is to entertain and I trust my journal will do the same. My intentions are not only to promote my work, but share with you the adventures and misadventures of a man who sincerely desires writing to be an important and major part of his life. I would encourage you to "friend" the journal and come along. The road will sometimes be bumpy and a little lunatic, but I trust it will be ... interesting. Also, I'm what is known as a parlor magician so I post a lot about that as well. So settle back with a nice icy mug of ginger beer and read on. You may want to visit here first and read my bibliography. In light of recent developments in the publishing community, I can affirm that no review of my work anywhere on the Internet has been paid for, nor have I ever received payment for a book review that I myself have done. I also affirm I have never solicited the removal of a negative review concerning my work, nor have I ever discouraged a reviewer from giving a negative review of my work. Also, all interviews listed on this blog contain questions developed with the interviewee so the interview is relevant and asks questions pertinent to what the interviewee wishes to communicate. You the readers are still left with the hard work of subjectively determining whether their works are worthy of purchase through reading other reviews and writing samples. If you enjoy the stories, please share them with your own friends on your own social media. Thank you! I love LiveJournal and will never discontinue my accounts here, but for many reasons, I have now switched over to Google Blotter. Unless you are a friend of my personal Facebook account, you are most likely unaware that last week was spent in hospital removing a tricky gall bladder. Preceded by a few weeks of agony, the last month has not been fruitful as far as writing goes. I still slog ahead with the third "chapter" of Doll Wars (if a 50,000 word novel can be called a chapter) and I've started blocking out the third story in my trilogy of magical house stories. The first story was Coventry House that took place in England and has been published numerous times. 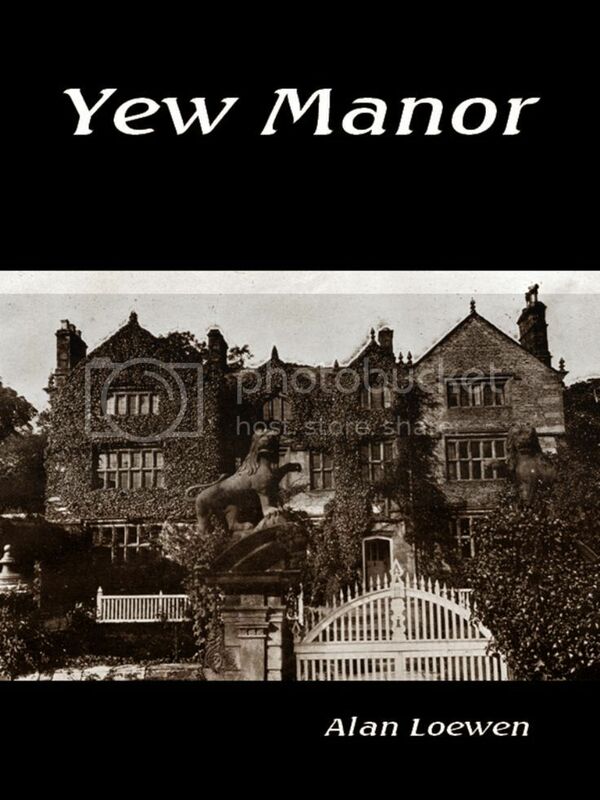 The second story, Yew Manor, takes place outside of Columbus, Ohio and is easily available through Smashwords.com. The third and final story has the working title of Silvanus House and would you like to see the opening paragraphs? Silvanus House has a will and Silvanus House has a way. It also has rooms and halls and doors and age, but one thing the Silvanus House does not have are ghosts. What it does have are memories and yet, in the early morning hours, I sometimes wonder if ghosts and memories may simply be the same. And the house is filled with memories. So much so, we who live within these walls feel Silvanus House must be timeless with reminiscence. Yet, that cannot be so. County records show it was built in 1846 by Merrill DuBois. I am the founder's great grandson and the people in the village below call me the master of Silvanus House. This is not true. Silvanus House answers to a greater Master than I. When Is An April Fool's Joke Not An April Fool Joke? When the offer is a real one. In honor of April Fool's Day I am actually offering the first two novellas in my Magic House trilogy for free. The only hang-up is that you have to create an account on Smashwords, but it is free and only takes a few moments. Books can be downloaded in the following formats: epub, Kindle, pdf, rtf, lrf, and text. Clicking on the titles (not the graphics) will take you directly to the website and use the coupon code to make the download free. And please, if you like the story, please leave a review! I share this with you freely because I love you. About eight years ago, I wrote a piece of flash fiction (1,650 words) about an author haunted by one of his literary creations. I titled it Kill Your Darlings and forgot about it. Tonight, my body sits in cold, damp Pennsylvania, but in my dreams, I sit at a very nice Parisian bistro on the corner of rue de Seine and rue Callot. Though the coffee before me tastes like it was strained through Balzac's sweat-stained linens, it is hot and the steam creates a perfect effect as it wreathes around my face. Behind me, the lights of the Eiffel Tower points toward the night sky, the stars lost in the perennial haze that blankets the City of Lights. Tonight is a night for toasting young lovers as they walk by my table, oblivious to my glass upraised in tribute to their happiness. It is a night for friends to gather at the bistros, a night for arguing Voltaire and the perversion of eating snails and other inconsequentials. Later, I dine on delectables at the Café Le Procope while on the stage a woman clad in black sable croons about lost love and a broken heart. I turn to the lovely young thing dining alone at the table next to me. I nod in appreciation of her young beauty and then nod toward the singer. "Everything sounds much more romantic in French," I say to her. "I swear the French could sing '100 Bottles of Beer on the Wall' and they could make the most cold-hearted listener burst into tears." Alas, she speaks no English and interpreting my comment as an insult dashes her glass of wine in my face. As the bouncers ignominiously toss me out into the street, I lay dazed on the sidewalk while mimes act out putting me onto a stretcher for the ambulance. Overhead, the mocking face of the cold moon stares down while laughing at my despair and I jerk awake in my cold office back in Pennsylvania, my neck painfully sore from falling asleep in such an odd position. Forget Paris. I hear Bermuda is just lovely this time of year.